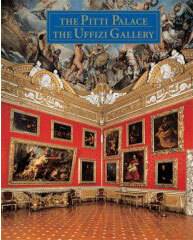 "This boxed set features two books showcasing two of the world's most prestigious museums: the Pitti Palace and the Uffizi Gallery. Situated across the Arno River from Florence’s busy city center, the 15th-century Palazzo Pitti contains the palace's splendid collections ranging from early masters like Giotto and Duccio to contemporary Italian artists. Aside from the palace's major paintings in the Palatine Gallery, its sculptures, decorative objects, and the magnificent Boboli Gardens are beautifully photographed. Florence’s Uffizi Gallery, on which construction began in 1560, houses such masterpieces as Botticelli's The Birth of Venus, as well as works by Da Vinci, Caravaggio, and Rubens. Connected to the Pitti Palace by a corridor designed by Vasari that crosses the Arno River, the Uffizi Gallery is a one-of-a-kind museum. This gorgeous oversize book showcases the extraordinary collection..."